Toby Lees with Craig Elliott. Toby Lees says Boston United must channel the frustration of their Leamington defeat when they travel to face FC United of Manchester. The two sides will meet in the National League North tomorrow (KO 3pm). 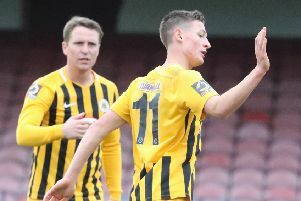 Lees, who has joined the club on an initial month-long loan from Harrogate Town, made his debut as a late substitute during Tuesday’s 2-0 defeat against the Brakes. He is now hoping to pick up his first points with the Pilgrims at Broadhurst Park. “It’s a tough place to go, nice ground and the fans get behind them, to be fair,” he said. “By no means it will be an easy game. Lees also hopes his move can help him become an established National League North player. “The chance came out to prove myself in a league I’ve made five or six appearances in,” he said. “I want to try and establish myself and develop myself. “I’m just going to come here and do what I think I can do, believe in myself and hopefully show that on the pitch.